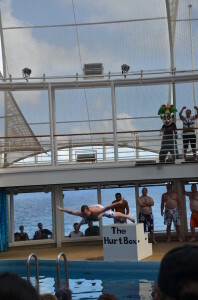 Yours truly, participating in the “Men’s International Belly-Flop Competition” at the AquaTheater on board Royal Caribbean’s Oasis of The Seas. Royal Caribbean is one of the world’s best cruise lines. There is something special for everyone to enjoy while on board. There is ice skating, the rock climbing wall, enjoying some quiet time in the Solarium pool, and even attending the “Love & Marriage Game Show”. 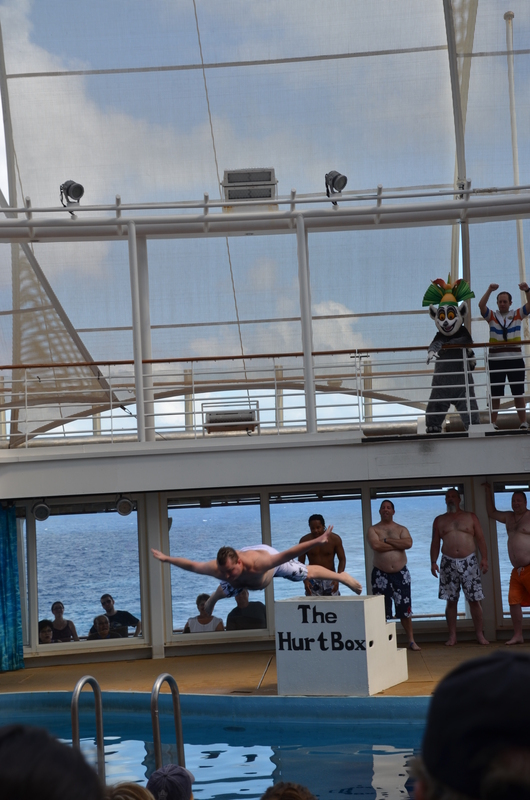 The one event which is top of every man’s list is the one, the only, the “Men’s International Belly-Flop competition”. Mark my words, everyone. Coming out the champion in the “Men’s International Belly-Flop Competition” is no easy feat. It takes great preparation, sacrifice, and a substantial lacking of diet discipline. 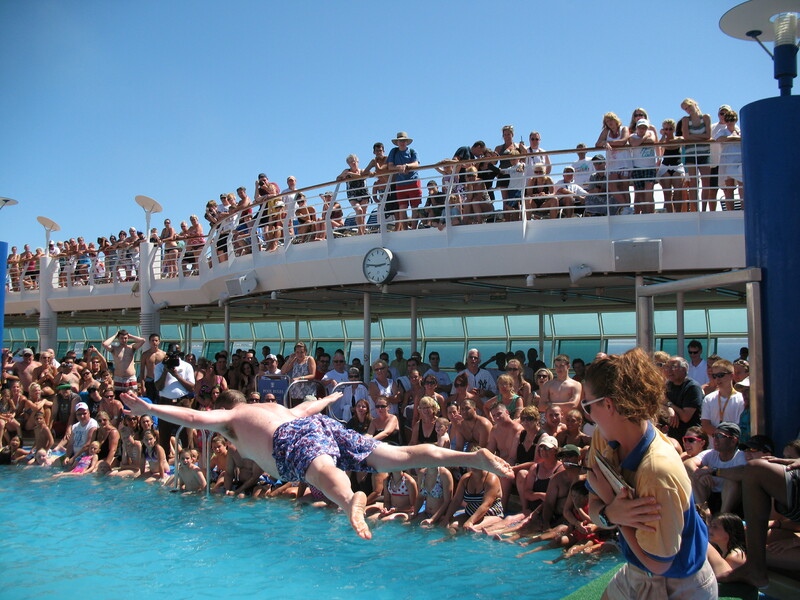 Having participated in the Men’s International Belly-Flop Competition” on four previous occasions, I wish to share with you gentlemen the most valuable advice you’ll ever receive from an experienced Royal Caribbean cruiser. Do you have what it takes to make it to the medal stand? Here are your keys to victory. Each morning of your cruise, eat nowhere else but the Windjammer Marketplace. At the Windjammer Marketplace, load up on all of the essentials. Load your plate up with bacon, port sausage, and turkey sausage. Along with the pork products, load up on fruit. You can never have enough Vitamin C in your system. Lastly, chase it all down with plenty of coffee. When done cleaning off your plate, go back to the buffet for a reload. After scarfing down the second load, go back for a third an fourth time. Repeat this process every morning until the day of competition. The Royal Caribbean restaurant staff will be cheering you on in no time. In between Royal Caribbean cruises, slacking off is unsatisfactory. Striving to be on the medal stand in the “Men’s International Belly-Flop Competition” requires a substantial amount of practice. Relentless practice is vital to making it onto the medal stand. You have to be serious about participating in this prestigious competition. Note: Do not practice while on board. You don’t want to give away any secrets to any potential contestants. Do you have an in-ground swimming pool at your house? Use it! Do at least half a dozen jumps per day. If the life guards at your town pool or health club don’t mind, practice there. Tell them it’s a top priority. 2) It’s All About The Buffet! Again, don’t get this confused with #5. Every day, at lunch time, head to the Windjammer Marketplace. At the Windjammer Marketplace, you must load up on anything that will put a few concrete pounds on the abdominal region. Focus on the hot dogs, french fries, pasta, tortilla chips, peel-and-eat shrimp, and roasted ham. When it comes to the “Men’s International Belly-Flop Competition”, maintaining a full stomach is key. Remember, the medal stand is calling your name. Load up on anything that will help you stick your landing. After scarfing down the hot dogs, the french fries, and all the good stuff, chomp down on some cookies for dessert. After the cookies, have some ice cream from the self-serve stations on pool deck. Finally, wash it all down with a few specialty drinks. I’d highly recommend the Fuzzy Navel and Long Island Iced Tea. See the article, “Cruise Drinks: Straight Up, and Straight Down”. 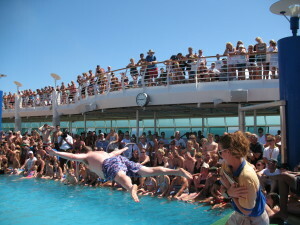 Yours truly again, participating in the “Men’s International Belly-Flop Competition” aboard Royal Caribbean’s Explorer of The Seas. 1) WHATEVER RICHARD SIMMONS SAYS, DO THE OPPOSITE! My personal advice to all of you potential belly-floppers: Forget what that clown with the big hair and funny shorts tells you. The “Men’s International Belly-Flop Competition” is your moment to shine. Remember to avoid the ship’s gym at all costs, give into temptation when a chocolate cake is in sight, and load up on the carbohydrates like never before. Visit the Windjammer Marketplace religiously. You also must remember that footage of the “Men’s International Belly-Flop Competition” will be featured in your Royal Caribbean “Cruise in Review” DVD. Many men of all sizes and shapes have bravely stepped onto the “Hurt Box” and have shown the ladies what their abdominal regions are made of. Do you have what it takes? Do you believe that you belong amongst this band of dauntless legends? Now, “Get Out There” and make your family proud!